When I was a teenager I found my father’s Beatles record collection in the attic (we’re talking vinyl, by the way). Ever since then, to me The Beatles has been the most important band on earth, ever. To this day, their music resonates within my soul, forming a large and interesting part of the soundtrack of my life. I guess everyone will be familiar with the Fab Four from Liverpool, so no further introduction is needed. Unfortunately, often the same can’t be said about their manager, Brian Epstein, who is far lesser known than John, Paul, George and Ringo. The Beatles having a grand ol time. In the reflection of the car window we see Brian Epstein, staying behind. One could fill a library with the large number of books that have been published about the Beatles over the years. 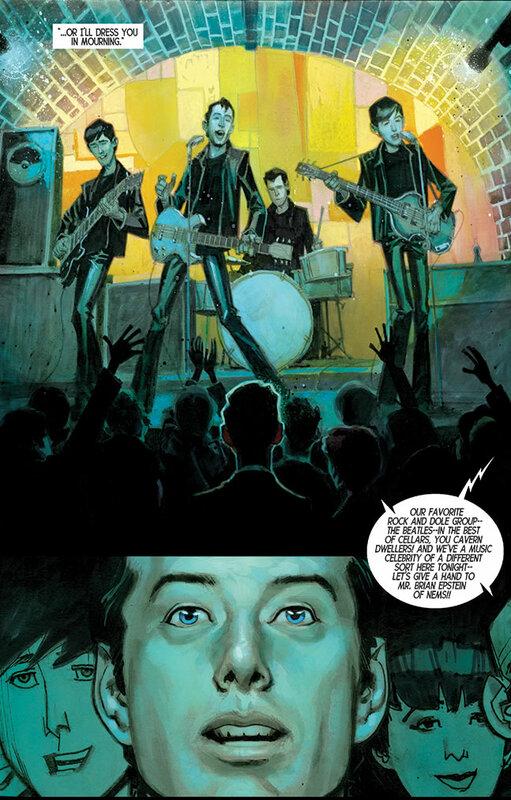 In the last couple of years, a couple of comic books about the boys from Liverpool came out and now there is The Fifth Beatle: the Brian Epstein Story to complement the lot. 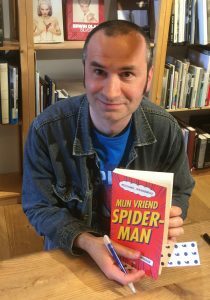 Graphic biographies are quite the trend in comic book land, it seems, and while generally speaking most of them are a bit stale and predictably follow the high and low points of someone’s life, some of them offer a good read. Fortunately, The Fifth Beatle, written by Broadway theatre producer Vivek Tiwary and expertly drawn by Andrew C. Robinson, is one of the latter category. The book tells the story of the young and talented Brian Epstein who saw the Beatles play in the basement club The Cavern in Liverpool in 1961, when he was twenty-seven years old. Brian was running his family’s music store and had tried his hand at fashion design before that. He decided to manage the Beatles and thanks to Epstein’s perseverance and vision they became an international success. Tiwary tells a very layered tale, not shying away from the dark episodes of Epstein’s life. Epstein was a gay man living in an area in which, according to British law, being gay was illegal. Even though he successfully managed the Beatles and other popular British acts, Brian kept focusing on his mistakes, feeling out of place and lonely, and trying to find a place to belong. He became addicted to drugs. Brian died at age 32, accidentally overdosing on sleeping pills. The book focuses on Epstein, letting the Beatles play second fiddle, which is fine, because Epstein’s story deserves to be told. I like the fact that Tiwary uses juxtaposition as a literary device. In a brilliantly executed sequence Epstein is meeting Colonel Tom Parker, Elvis’s manager, for lunch. Parker is depicted as a greedy, ruthless and red-eyed devil who wolfs down his food, while Brian is shown to be a modest, well-mannered gentleman who hardly touches the grapefruit he ordered. 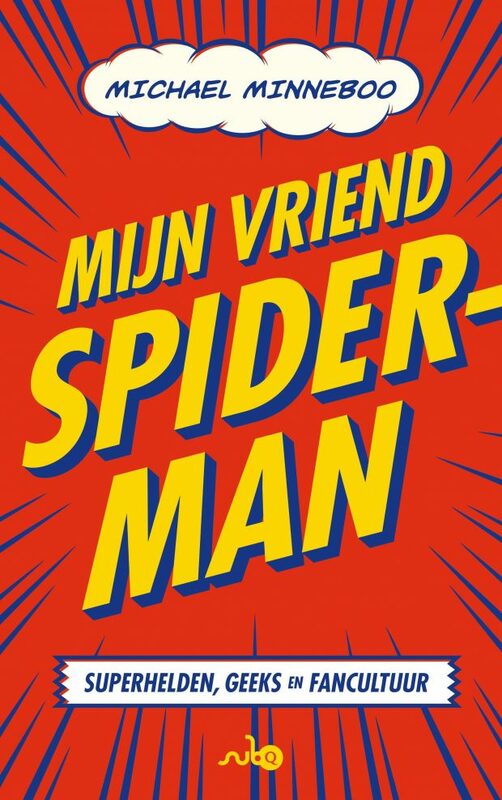 Robinson uses a very lively style that sits between caricature and realism, which works well with Tiwary’s tone of voice, which is serious and witty at the same time. Cartoonist Kyle Baker got to draw some of the more unfortunate episodes in the history of the Beatles, like their troublesome tour in the Philippines and the backlash from John Lennon’s infamous ‘We’re bigger than Jesus!’ comment. Baker uses a cartoon-y drawing style that pays homage to the Beatles cartoon series, and the overall tone of this section of the book is brighter and funnier. In my opinion, since it doesn’t match with the rest of the book stylistically, it could have been left out. Brian in awe of the Beatles. ‘As it turns out,’ the writer explains in his afterword, ‘almost everything in the pages you’ve just read actually did happen. But conveying the truth – while important – has never been my primary goal. 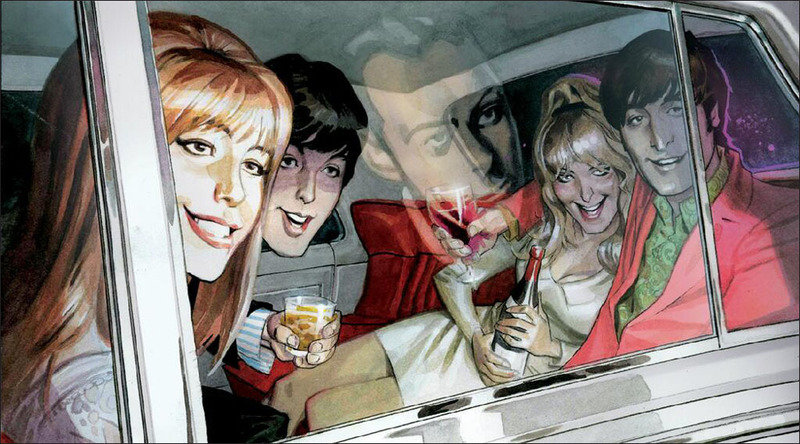 My goal with The Fifth Beatle is to use 130 pages of my words and Andrew C. Robinson’s gorgeous art to reveal not just the facts but the poetry behind the Brian Epstein Story.’ As far as I am concerned, Tiwary succeeded very well in his intention. The Fifth Beatle is an interesting graphic poem. This review is published on the blog of the American Book Center. Washing clothes, bed sheets and towels is a never-ending story.